The following is a guest post by three individuals who have taken it upon themselves to investigate the academic credentials of Ravi Zacharias. They have included their names, and their own academic qualifications and can be contacted by commenting on the post. Any comments or questions posted, will be sent to them. We are two atheists and a Christian who are concerned that a prominent evangelist, Mr. Ravi Zacharias, has engaged in misconduct that undermines academic integrity and that tends seriously to mislead the public at large. We issue this Press Release with two primary goals in mind. 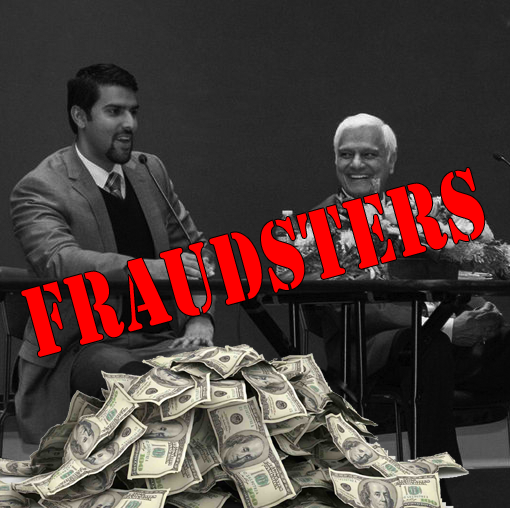 First, we wish to draw attention to what we believe are the dishonest practices of Ravi Zacharias. Second, we hope the facts presented here will prompt professional journalists and investigators to continue the work we have started. Steve Baughman is an attorney and part time philosophy student at the Graduate Theological Union in Berkeley, CA. He holds a Masters Degree in Asian Studies from University of California at Berkeley. He is the creator of the YouTube channel Friendly Banjo Atheist, which first presented the matter of Mr. Zacharias’ credentials to the public. Tom Lunal has a B.S. in Mathematics from U.C. Santa Barbara and an M.S. in Computer Science from USC. He worked for Microsoft before moving to a position at New York Life. Andy Norman is a professor of philosophy at Carnegie Mellon University (CMU). He has a PhD from Northwestern University and has published widely on the norms of responsible discourse. Ravi Zacharias is a world renowned Christian evangelist who has written over a dozen books. Former White House counsel, Chuck Colson, called him “the great apologist of our time.” Mr. Zacharias maintains a busy travel schedule lecturing all over the world. He resides in Atlanta, Georgia, where his ministry, Ravi Zacharias International Ministries (RZIM), is headquartered. RZIM has numerous overseas offices and maintains a staff of over 100 people. According to Mr. Zacharias’ website, his weekly radio program, “Let My People Think”, airs on over 2,000 outlets worldwide. Ravi Zacharias has claimed for many years that he was a “visiting scholar at Cambridge University.” He presents this claim prominently in his press bios and in his memoirs. He makes frequent mention of it in his public appearances (in about 90% of his youtube videos). It is by far the most impressive item in his academic portfolio. The claim is absolutely false. The University of Cambridge press office has confirmed the same to us. We recently contacted Mr. Zacharias and informed him of our belief that he has misrepresented having been a “visiting scholar at Cambridge University.” We informed him of our intent to go public with this information and we asked him for a response. None came. Shortly thereafter Mr. Zacharias deleted the claim from his official website bio. Until several weeks ago, Mr. Zacharias’ website bio at RZIM.org stated, “Dr. Zacharias has been a visiting scholar at Cambridge University.” Mr. Zacharias is frequently introduced at his university appearances as having been “a visiting scholar at Cambridge University.” The President of Liberty University said “Ravi was a visiting scholar at Cambridge university” when awarding him an honorary doctorate recently. The claim also appears on the jacket of his book, The Real Face of Atheism and a few of his books claim in the back cover that he was educated at Cambridge University. A Google search of [“Ravi Zacharias” “visiting scholar at Cambridge University”] reveals thousands of pages in which the claim is repeated. The claim is false as mentioned earlier, and Mr. Zacharias withdrew it shortly after we asked him for a response to our concern that he has misrepresented his Cambridge visiting scholar status. 1. “We can confirm that Mr. Zacharias spent a sabbatical term at Ridley Hall in the city of Cambridge.” He was there for a mere 12 weeks (1 term). 2. “Ridley Hall is independent from Cambridge University and trains people for effective work in the Church of England”. Insofar as it is exclusively the province of the University of Cambridge to decide who constitutes a “visiting scholar” at their institution, we believe it to be established beyond dispute that Mr. Zacharias’ visiting scholar claim is false. We sincerely ask that you contact Cambridge University and Ridley Hall independently and verify this information. 1. The close connection between the University of Cambridge and Ridley Hall justifies the claim. No it does not. We note that his website was recently changed to state that “Dr. Zacharias has been a visiting scholar at Ridley Hall, Cambridge (then affiliated with Cambridge University, now more recently allied with Cambridge and affiliated with Durham University) where he studied moralist philosophers and literature of the Romantic era.) This is totally false. It makes it seem as if Ridley Hall was a constituent Hall of Cambridge University back when he was there. The officials at Cambridge University and Ridley Hall confirmed that it has never has that affiliation. Ridley Hall has always been an independent clergy training school and never part of Cambridge University. However, we acknowledge the close affiliation between the University of Cambridge and Ridley Hall. Both are in the town of Cambridge, and both are part of the Cambridge Theological Federation (CTF). There are various institutions that are a part of the Cambridge Theological Federation and the students and others are allowed to utilized the facilities, libraries at these various schools. They are also able to take a few Cambridge, Durham etc. accredited courses. That’s it, no more, no less. No one can ever claim that being at one equals to being at the other as Ravi Zacharias might claim. We believe it to be a misleading practice to claim to have been a “visiting scholar” at one institution by virtue of one’s doing a sabbatical at a different “affiliated” institution. We note that Mr. Zacharias’ supervisor at Ridley, Dr. Jeremy Begbie, who taught at both Ridley and Cambridge University, draws a very clear distinction in his own Curriculum Vitae between Ridley Hall and Cambridge University. (See https://divinity.duke.edu/academics/faculty/jeremy-begbie ). Again, the University of Cambridge has told us in writing that ““Attending lectures and classes at the University of Cambridge whilst on sabbatical at Ridley Hall would not confer University of Cambridge Visiting Scholar status on a student.” The Director of Programs at Ridley Hall actually said “that such a claim might be made for personal benefit but would be absolutely false. If you want to study at Ridley, you would apply to Ridley and if you want to study at Cambridge University, you would apply to Cambridge University.” There is absolutely no justification for making any of the claims that Ravi Zacharias has made even if he took a few classes at Cambridge. Seeing that he was there foronly 12 weeks, just how many classes would he have taken anyway? Additionally, just think about it. Even if we, for the sake of argument grant that he was indeed a visiting scholar at Cambridge University (which he clearly was not! ), does it justify the marketing and publicizing he has done for years trying to pass as a Cambridge scholar. His book, DVDs, CDs, public talks, sermons, speech bios etc. are full of references to being a visiting scholar at Cambridge University, making it look like he spent years doing research at that fine institution. The actual fact of the matter is that he was never a visiting scholar at Cambridge University but was on a sabbatical at Ridley Hall. Now we move to the designation of visiting scholar status. The official record at Ridley Hall says that he was on Sabbatical for one term (12 weeks). You can check it out independently. Just call them! We acknowledge that the term “visiting scholar” is used both formally and informally. In its formal sense it carries great prestige, especially at respected institutions like Cambridge University. In its informal sense, it can mean nothing more than attending lectures and classes for a short period while on sabbatical at a given institution.However, the informal designation cannot be utilized for official purposes. For instance, if I go to Cambridge and do some research for a few months and interact with faculty/students, I could unofficially call myself a visiting scholar but unless the university has officially invited me I cannot claim so in official documents. This, however, is precisely what Ravi Zacharias has done. His official records show that he was on sabbatical at Ridley Hall but he claims that he was visiting scholar at Cambridge University. He writes in his autobiography that he was “invited by Cambridge University.” This is not a case of stretching the truth, its a case of telling an absolute lie. Mr. Zacharias clearly intends us to understand his “visiting scholar at Cambridge University” claim in the formal, prestigious sense. It is, quite simply, the crown jewel of his otherwise very unremarkable academic history. It is a claim he has trumpeted loudly and widely. To be sure, Mr. Zacharias may now urge as his defense that he intended the claim to be understood informally (perhaps as nothing more than him attending lectures and classes at Cambridge while he was at Ridley.) But the more Mr. Zacharias drifts from the formal/prestigious conception of the term “visiting scholar,” the more the public will be justified in feeling deceived. Why make such a big issue of it in the press materials (books, videos, CDs, speech bios etc.) if it was an informal arrangement involving nothing more than “attending lectures and classes”? We believe that Mr. Zacharias’ deception is clearly established. Nevertheless, we believe that we might gain greater clarity as to the depth of that deception if several outstanding questions be answered. We hope others will be more successful than we have been in obtaining information from Mr. Zacharias about these significant matters of concern. The website at RZIM claims that “He has been honored with the conferring of six doctoral degrees, including a Doctor of Laws and a Doctor of Sacred Theology.” Please notice the wording. This makes it look like he earned these doctorates, especially to the person in the pew. What it should say clearly is that “He has been conferred six honorary doctoral degrees, including a Doctor of Laws and a Doctor of Sacred Theology.” Again, there is always this need for Mr. Zacharias to boost his credentials by either telling a lie or by making things unclear. Mr. Zacharias claims to have “lectured at the world’s most prestigious universities.” (See for example the jacket of his book The Real Face of Atheism. In his autobiography he states, “I have spoken on almost every major campus – Berkeley, Princeton, Cornell, you name it. If we haven’t been to a major school it is more often than not because we haven’t had the time to accommodate the request.” Walking from East to West, p. 209. We are concerned about the extent to which Mr. Zacharias’ claim implies that his appearances at such universities have been pursuant to invitations from the faculty or the institutions. It is our understanding that Mr. Zacharias’ appearance at prestigious universities has been primarily, if not exclusively, pursuant to invitations from student clubs and Christian evangelical organizations or local churches. For instance, many of Mr. Zacharias’ appearances at prestigious universities have been sponsored by the Veritas Forum, a Christian campus ministry that promotes discussion “about life’s hardest questions and the relevance of Jesus Christ to all of life.” Mr. Zacharias is closely connected to the organization, appearing in their promo video and writing the preface to the Veritas founder’s book. http://veritas.org/about/#link1. He has never been invited by Harvard, Yale or Princeton universities i.e., officially by the universities for any lectures. However, he often refers to his lectureships at various leading universities in the world. Misleading at best and false at worst. None of the schools he mentions, like Harvard, Yale or Princeton have officially invited him to give a lecture. He was just on their campus at the sponsorship of the Christian organization, the Veritas Forum. It is an open question whether Ravi Zacharias qualifies as any kind of scholar at all. Not only has he no doctoral degree, to our knowledge he has published nothing in scholarly journals, done no peer-reviewed research, and his academic qualifications are limited to his having a Masters of Divinity and having held the chair of evangelism and contemporary thought at a missionary training school, Alliance Theological Seminary in Nyack, NY. He is a great speaker and communicator but no scholar. If he really is a foremost thinker and philosopher, has he ever delivered a paper at the American Philosophical Association, The Society of Christian Philosophers, The American Academy of Religion, The Evangelical Philosophical Society, The Evangelical Theological Society or any other academic forums? the answer is NO. 1. His claim about being a visiting scholar at Cambridge University is absolutely false. 2. Cambridge University as well as Ridley Hall have given us written statements that this claim is false. 4. He continues to project the false impression that his doctorates are earned. 5. He continues to project the false impression that he is a scholar lecturing at leading universities like Harvard and Yale. A claim that is absolutely false. None of these universities recognize him as an academic or intellectual. 6. He is a great speaker and communicator but not a scholar in any way. His false projection is not fair to those who are actual scholars. 7. All that Ravi and RZIM need to do is to present an official letter from Cambridge University that he was a “visiting scholar” at their institution and the inquiries and investigations will end. Neither he nor RZIM are undertaking any efforts to get this done because you cannot substantiate a lie. Oooh, Ravi sounds like he is in big trouble. Well, he should have thought about it beforehand. In sha Allah brother. or In sha Allah mercy.